I arrived at 2:50 pm for my 3:00 pm appointment. There was no one at the desk and the employee, aman, sat there and chatted with some customers. He basically ignored me. After a few minutes, he gave me an intake form and told me to fill it out and take a seat. I filled it out by 3:00 and he was stillchatting with the customers. I stood up and he ignored me some more. Another woman came in and said she was there for a 3:00 appointment. I thought there was confusion, as all 3 of us waiting in the room to be seen by the same optometrist had 3:00 appointments. She took the first woman who had been there before me, and I wasn’t seen until about 3:40. As I was leaving, I saw the final woman who had arrived for a 3:00 was just getting taken in. I could tell we were purposely triple booked but the optometrist and staff didn’t want to address it or seem to care. I get the feeling this is a common practice for them and they’re just in it to make money, not actually care for patients. I arrived at 2:50 pm for my 3:00 pm appointment. There was no one at the desk and the employee, a man, sat there and chatted with some customers. He basicallyignored me. After a few minutes, he gave me an intake form and told me to fill it out and take a seat. I filled it out by 3:00 and he was stillchatting with the customers. I stood up and he ignored me some more. Another woman came in and said she was there for a 3:00 appointment. I thought there was confusion, as all 3 of us waiting in the room to be seen by the same optometrist had 3:00 appointments. She took the first woman who had been there before me, and I wasn’t seen until about 3:40. As I was leaving, I saw the final woman who had arrived for a 3:00 was just getting taken in. I could tell we were purposely triple booked but the optometrist and staff didn’t want to address it or seem to care. I get the feeling this is a common practice for them and they’re just in it to make money, not actually care for patients. Dr. Chang is very patience and professional. Excellent with state-of-the-art equipment. Highly recommended. Dr. Qiaomei Cheng, OD, PhD, received her Doctor of Optometry degree from the New England College of Optometry (NECO) in Boston, MA. 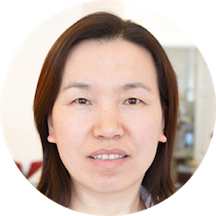 She holds a Ph.D. degree in Microbiology and Molecular Biology from Peking Union Medical College in China. She has trained extensively at New England Eye Institute, Community Health Centers and Nursing Homes in Boston area, Perkins School for the Blind, and VA Hospital in Boston. Dr. Cheng has also worked as a Research Fellow at Brigham and Women’s Hospital, Harvard Medical School and Tufts Medical School. Board Certified in the treatment and management of ocular disease, Dr. Cheng is an active member of both the American Optometric Association and the Massachusetts Society of Optometrists. Dr. Cheng is very patience and professional, and I would highly recommend her to others. My appointment was quick and extremely helpful! I’ve seen Dr Cheng annually for the last several years now for an exam and contact fitting... Always a positive experience! Excellent service and very knowledgeable staff and doctor! Dr. Cheng was nice, informative and professional. She explained the changes in my prescription, and made recommendations on what my options were. I would recommend her to others. Very professional, prompt, and friendly service as I had last year for my eye exam. Always generous with samples, too. Very fast, thorough, and knowledgeable. Dr. Cheng was very friendly and professional. She seemed very knowledgable about optometry and really listened to my concerns and questions. I highly recommend Dr. Cheng. Overall, I had a great and smooth experience! Dr Cheng is nice but I felt she hurried through the exam and didn't take the time to listen to my responses on which option was clearer during the eye exam. She gave me a much lower prescription than I havehad in the past and she said to try this pair of contacts and let them know. I saw her on Saturday, I called today (Tuesday) because I cannot see well at all - I have worn contacts for 15 years and I know that this is way too low. She tried to tell me my eyes have gotten better, that the prescription can improve, but I really notice that I cannot see as well. Now they can't get me in until 5:00pm on Friday! Not a convenient time! So I have to spend this week not seeing well. I am frustrated. Very pleasant. Answered all my questions. Very knowledgeable about eye diseases that run in my family. Very helpful picking out eyeglasses since I can't see how they look on me. This is my 2nd time seeing her. Definitely going back next year. I arrived early and was taken right away. The doctor and office staff were professional and thoughtful in their interactions with me. Immediately felt welcomed by the office staff member and the doctor. The appointment was smooth and everything was explained in a manner that I could understand clearly. Felt comfortable to browse glasses at my own pace and enjoyed the helpfrom both the doctor and the office staff member. I never felt rushed in any way even with quite a few questions. Had to have my eyes checked for possible diabetic problems and the doctor was very helpful in explaining the process and how much diabetes can affect our eyes. I was thoroughly pleased beyond words with my appointment. Great, came with all eye tests and free prescription glasses. Thank you! Very nice doctor and office. The were polite, caring and professional. Quick and easy. Did all the tests and was out within half an hour! Dr. Qiaomei was very polite and professional. She explained different options for contacts when i inquired. I was early for my appointment and was able to start a few minutes early as a result. My only hesitation during the visit: duringthe eye exam, there was no tissue, napkin or kimwipe on the chin or forehead rests. I was not present in the room before or after the test so its possible they were cleaned. This didn't bother me but it may bother a germaphobe. This was an exceptionally informative and helpful comprehensive appointment. I had procrastinated about optical care, and Dr. Cheng and her associate answered all of my questions and anticipated many of them, too. I would recommend dr Cheng and assoc. they were very helpful to my grandson and took extra needed time he required. Very thorough and professional. Good selection of frames and excellent purchase price for glasses. Very convenient office (across from Green Line T) that was meticulous but inviting. Dr. Cheng was very friendly and professional. She double-checked my vision sight metrics and gave me a spare of contact lenses to test the perfect fit. I would highly recommend her. Thanks a lot. Very professional and nice. Did find their english to be difficult to understand, both the dr and receptionist. Not much explanation with whole exam procedure either..